Two options for a 'Core Values' poster (2015) for a partnership between HIVMA, SHEA, IDSA, and PIDS. The organizations wanted to emphasize the importance of equality among organizational values and wanted their partnership poster to reflect that. The final product print size is 36"x48". The second poster design was the final decision. A .gif advertisement (2015) for the gnovis annual spring conference, gnoviCon. The conference included a speaker, panel discussion and "Data Jam" activity relating to the topic of using open data sources. A book advertisement for the back cover of the conference booklet at the 2015 American Political Science Association (APSA) Teaching and Learning conference in Washington, DC. This image (2013) stood as the header graphic for a digital diplomacy discussion facilitated by the CO.NX team at the Department of State about South American business development. This graphic (2013) headed up a streaming discussion on the future of online education and a new series of MOOCs taught at some of the world's most prestigious universities. A cover page for a Georgetown University and Center for Civic Education (CCE) report on knowledge acquisition in We the People civic education classrooms. This design includes three thematic iterations, adorning the cover of two subsequent reports currently in progress. Access the full report, which I contributed to as a Research Assistant, on the CCE website. A cover page for a Georgetown University and Center for Civic Education (CCE) report on civic dispositions in We the People civic education classrooms. This design includes three thematic iterations, adorning the cover of two subsequent reports currently in progress. Access the full report, which I contributed to as a Research Assistant, on the CCE website. 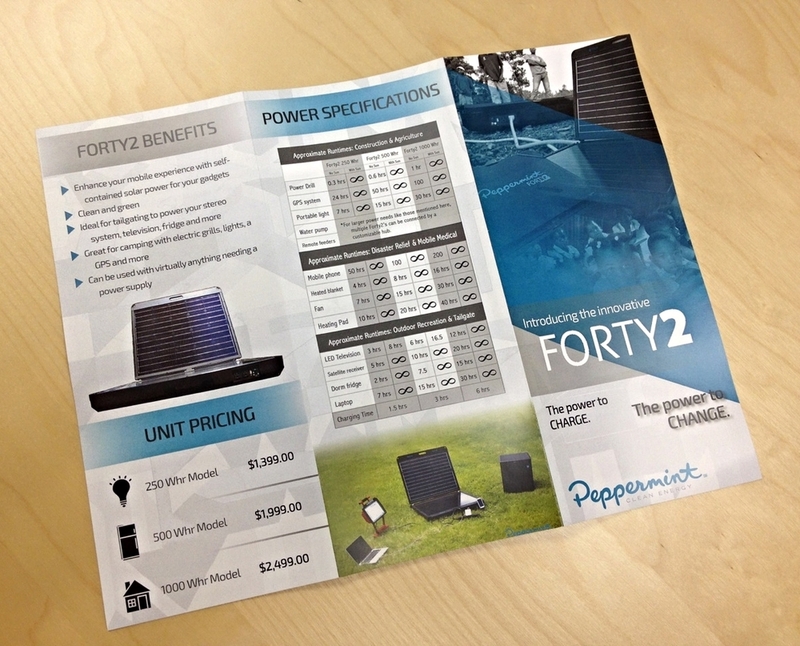 A brochure design update (2014) for Peppermint Energy's main product, the Forty2 solar generator. The Sioux Falls, South Dakota-based startup manufactures and implements portable solar units for developing countries and disaster relief areas.